Mahale Mountains National Park lies on the shores of Lake Tanganyika in Kigoma Region, Tanzania. Named after the Mahale Mountains range that is within its borders, the park has several unusual characteristics. First, it is one of only two protected areas for chimpanzees in the country. (The other is nearby Gombe Stream National Park made famous by the researcher Jane Goodall.) The chimpanzee population in Mahale Mountains National Park is the largest known and due to its size and remoteness, the chimpanzees flourish. It also the only place where chimpanzees and lions co-exist. Another unusual feature of the park is that it is one of the very few in Africa that must be experienced by foot. There are no roads or other infrastructure within the park boundaries, and the only way in and out of the park is via boat on the lake. The Mahale mountains were traditionally inhabited by the Batongwe and Holoholo people, with populations in 1987 of 22,000 and 12,500 respectively. When the Mahale Mountains Wildlife Research Center was established in 1979 these people were expelled from the mountains to make way for the park, which opened in 1985. The people had been highly attuned to the natural environment, living with virtually no impact on the ecology. Satellite image of the park. The borders are outlined in yellow. Wikimedia Commons has media related to Mahale. ^ "Tanzania National parks Corporate Information". Tanzania Parks. TANAPA. Archived from the original on 20 December 2015. Retrieved 22 December 2015. ^ Jens Finke (2002). Rough guide to Tanzania. Rough Guides. ISBN 1-85828-783-9. "Mahale Mountains National Park". NASA Earth Observatory. Retrieved 2006-05-01. 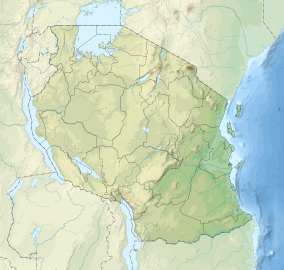 This Tanzania location article is a stub. You can help Wikipedia by expanding it. This page was last edited on 24 January 2019, at 16:22 (UTC).